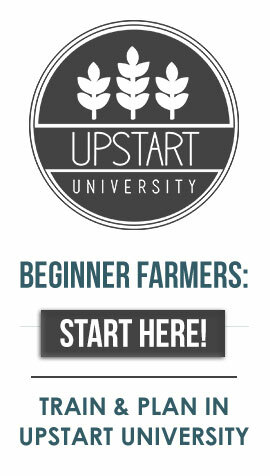 Get your Annual Unlimited Membership to Upstart University! Looking to get the most bang for your buck? Get 2 months free (save over $19.98) when you sign up for an annual subscription. You’ll get 12 months access for just the price of 10! For a one-time payment of just $99 (renews annually), you’ll learn everything you need to know about starting a modern farm and you’ll have first dibs on other specials, promotions, and future product launches. If you’re starting your own farm, this is the best investment you’ll ever make. This Unlimited Membership gets you year-long access to every course, exclusive discounts and events, Upstart U exclusive resource pages, full support, and more! *This membership is non-refundable. At the end of the year, if you do not want to renew, you must cancel your subscription before the renewal date. If you have questions, please review our cancellation & refund policy here. Note: this membership does not include free access to ebooks and PDFs published by Bright Agrotech or Upstart University. However, Upstart University students do receive some special discounts and offer on some of these items. The price for membership is $99 now, then $99 per year all following years. This subscription will automatically renew one year from the date of purchase unless canceled. If you do cancel your subscription, you will no longer be eligible for the yearly discount.